by atkinsontshirt.In Apparel Decorators Only.1 Comment on ISS Long Beach Show Recap – Big Success! 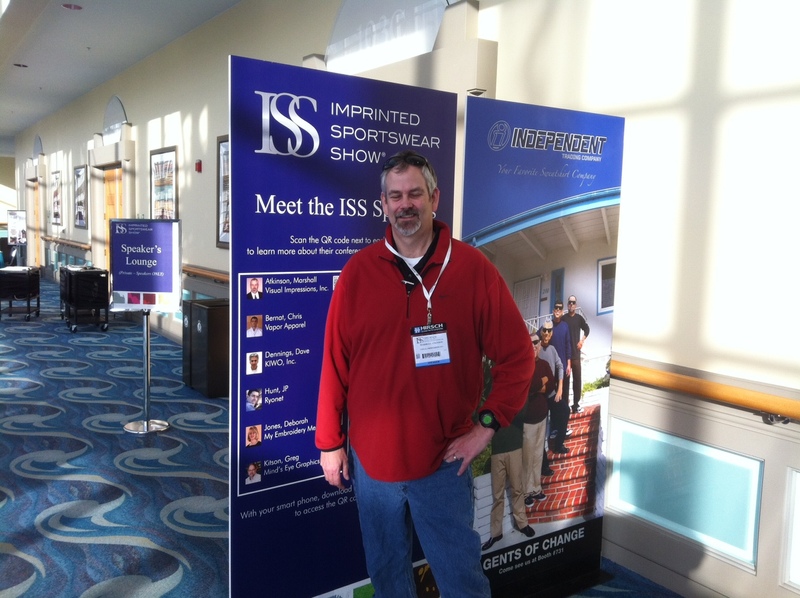 I just returned from an outstanding couple of days at the Imprinted Sportswear Show in Long Beach California. I’ve attended many of these types of shows over the years, but this one stands out for several reasons. First, and the most obvious reason, was that I gave a presentation on building a sustainability program in an apparel decorator shop. Second, I was representing my new employer, Visual Impressions, and was very happy to see some great interaction with the vendors at the show. Although, I didn’t get to see everyone I had hoped to (time limitations), I thought I’d recap some of the major highlights of the show and share with everyone. I’d like to give the primary shout out to everyone that signed up for my class, “Sustainability: Reduce, Reuse and Recycle and Lower Your Operating Expenses”. Everyone that attended the class was involved from the start and we had a great interchange of ideas and tips. If you were in the class, please give yourself a pat on the back for being so forthright with your questions and for sharing how you are doing it in your shop. Great job!! I’d love to hear back from you on how you implemented any of the ideas I presented or that others shared. Another big thank you to Laura Caskey with Nielsen Expositions for making my first time giving a presentation at the event so easy. She was very organized and wonderful to work with. Thanks! Jay Berman (owner of Visual Impressions, my employer) and I had a wonderful dinner with Greg Kitson, owner of Mind’s Eye Graphics, and Deborah Sexton, owner of Saracen Communications and long-time industry journalist. It was fun sharing how everyone entered into this industry and thoughts on the future. I’d also like to publically thank Greg for mentoring me on the presentation process with these shows, as I appreciate the help and support from a long time veteran. Had a great breakfast on the Queen Mary (sorry no ghosts were in sight), with Jay, Rich Pulliam with Midwest Sign & Screen Printing Supply, and Marci Kinter with SGIA. I’ve known Marci seemingly forever and have spoken to her countless times on the phone, in webinar panels, and by e-mail, but unbelievably have never met her in person. It was great opportunity for me. Getting some insight on the current and future state of the Consumer Product and Safety Information Act challenges with our industry ink was extremely enlightening and worth its weight in gold. I also loved meeting and sharing some ideas with Rodney Blackwell with tshirtforums.com. He’s a super guy, and I really like the free exchange of ideas on his forum. Lots of new and future industry superstars go there first to start their journey in the biz, and Rodney gets to help them along their way. Thanks for your time Rodney! Keep up the good work! I was really amazed at the growth in the digital sector in the industry. Every other booth has some sort of new digital printer, sublimation or process. Anyone who thinks the future of the industry isn’t moving to digital is delusional. The standout printer of the show is the new Kornit Avalanche. (see http://www.kornit-digital.com/NewsAndEvents/?page=22&pageType=3&ID=503 for their press release) This is going to be a revolutionary machine in the industry, and it’s not just about the blazing speed either (300 shirts per hour) as they have increased the print size to a huge 23.5” x 35” image, and also the availability to run two completely different jobs simultaneously on the two platens. This equipment can take an art file from the web and print it on a shirt without any art department prep or human involvement. To me, this was the standout piece of equipment at the show. Before the show they had over 40 of these placed in shops around the country, and I spoke with a salesman later Friday evening at a reception and they sold four at the show. This is the direction we are heading folks. I also find it strangely amusing that people that interested in getting into the DTG market are not calculating the cost of the ink, pretreatment labor step, and other variables into their purchase price ROI calculations. They all want the $20k printer, but aren’t looking past that purchase price and into the true cost of the printer which is their ink and labor. (which also depends on their production volume – I get it) I spoke to several people at the show and to a person they were dismissing this calculation and just focusing on the “get it in the door” price. Speaking of strangely amusing, I also am left wondering why so many printers have not even heard of the regulations for lead and non-phthalate inks as mandated by the CPSC. For those of us that want to do this right, any increase in cost that we may have to add to the price of doing youth shirts is going to be undercut by some uninformed slob down the street that doesn’t even care. Even some of the larger shop owners and production managers I spoke with aren’t following or worrying about this. This is going to get uglier than it already is now. Another great new piece of equipment to see is SignTronic’s ScreenMaster, which is a fully automated direct to screen system that not only images the screen, but washes out the emulsion and dries the screen for you. (here’s the link to the video http://www.signtronic.com/Video/stm-tex_web.mp4) This was extremely cool, and a big thanks to Lee Bryhn for walking us through the system. You can get about 30 screens an hour through the machine, and basically reduce your screen room labor down to just a few people, as the equipment does all the work. Big price tag, and if you need more than 30 screens an hour it’s going to be too slow, but a great innovation. Loved talking shop with all the great folks at Wilflex/Polyone and NazDar. Good to see them, and I’d like to say thank you to Rob Coleman for his insights with the CPSC regulations, Peter Walsh for just being Peter Walsh, but for also help arranging for a DM4 demo, and to Adam Scaife for introducing us to Dave Swart Director of Operations for New Buffalo Shirt Factory. Great hearing Dave’s insights on the industry, operations, and resolving challenges. Good seeing Carl Busey, and talking shop with him too. On a personal note, I’d like to give thanks to my new employers Jay Berman and Todd Richheimer with Visual Impressions. They are truly great people to work for, and are actively involved with the business and “get it”. I’ve been working for them since August and really love the attitude, feedback, enthusiasm, and respect that they have shown me. Thanks for picking up the tab for me for this show and for next month’s one in Orlando. If you do business with Visual, you know what I’m talking about when I say they are great guys…if you haven’t placed an order with us yet – it’s not too late! Try us and see the difference. I’d also like to give some thanks and credit to my wife Jody for helping me as always. She motivates me constantly to be a better person, see things that I don’t, and to remind me of not only where I’ve been – but more importantly where I’m going. Thanks babe! Daisy. Lastly, if I missed seeing you at the ISS Long Beach show, there’s another opportunity a few weeks away in Florida at ISS Orlando. I’d love to spend some time with anyone and compare notes on how to resolve challenges, improve, motivate staff, build a better schedule, handle CPSC regulations, talk about sustainability, or just catch up on life’s struggles.